Thomas Built Buses Debuts Pedestrian Detection Prototype | Sonny Merryman Inc. When a pedestrian is detected, Thomas Built’s new system will alert the driver on an in-cabin tablet and through caution lights on the cross-view mirrors. 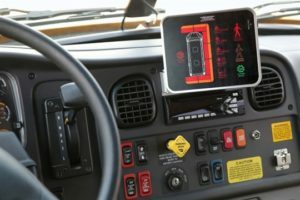 HIGH POINT, N.C. — Thomas Built Buses debuted a prototype of its new pedestrian detection technology at the STN Expo on Tuesday. Leslie Kilgore, vice president of engineering for Thomas Built Buses, said that the company has been working with MITO Corp. and CUB Group to develop the pedestrian detection system, and “the technology is 90% there.” The goal is to prevent accidents in the danger zone around the school bus, such as when students step too close or kneel down to pick something up. Part of the BusWise Technologies suite, the new pedestrian detection feature will consist of LED ground lights on the cross-view mirrors as well as multiple radar units on the 77GHz frequency band, which will be installed around a Thomas Built bus. These higher-frequency radars, which are used for autonomous vehicles and high-resolution meteorological observations, allow for more precise detection and measurement of a pedestrian or object within 10 feet of the school bus, according to Thomas Built Buses. When a pedestrian is detected, the system will alert the driver on an in-cabin tablet as well as through caution lights on the cross-view mirrors. Thomas Built Buses will show the pedestrian detection system at other upcoming shows and will announce a production date in the near future.